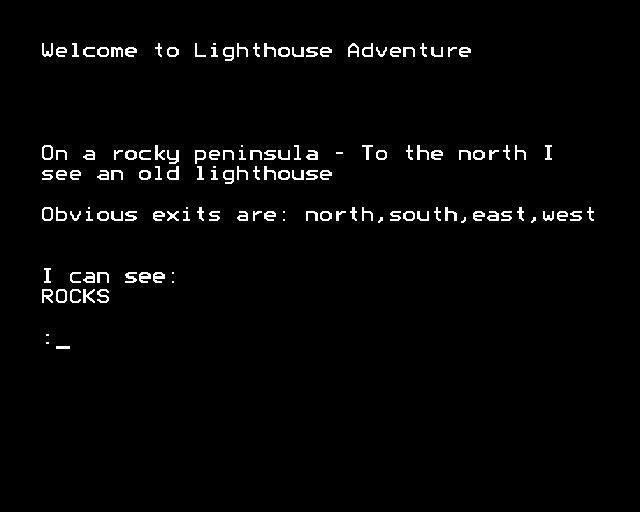 Lighthouse adventure is a text adventure game written in BASIC for the TRS-80 Color Computer. It was published in the Rainbow Book Of Adventures in 1983. The game was ported to BBC BASIC for the BBC Micro computer in 2018. In the late 1700's an old English ship carrying jewels and gold was seized by pirates in a violent storm. The crew, weak and sick from the long journey, could not properly defend the ship and her invaluable cargo. The pirates killed everyone on board and set sail for America. Months later, they arrived off the coast of a New England peninsula and smuggled the priceless gold on shore. They quickly found a hiding place for the treasure. According to the legend, no one ever found the smugglers or the treasure, but most people believe the gold is located in or near the lighthouse. Over the years, many have tried unsuccsessfully to find the legendary gold, but either quit, or died in the quest. This exciting adventure leads you on a magical hunt to find the smugglers hideout, take the treasure and make your getaway. You will encounter many tips along the journey, and here's a helpful one before you begin: The British call it a "trolley", but in America, we call it a "dolly".